The forthcoming iPad mini 2 may become a favored choice for many Apple users to enjoy videos. The large internal storage gives the highest possibility to save a mass of hot-trending videos for on-the-go enjoying. The large capacity battery power ensures super-long time for video playback. And the high resolution display heightens the video enjoyment in a crisp and vivid way. Though the Apple iPad Mini 2 have many advantages, but still there is an irritating issue: it doesn't support FLV video (flash video), which is the most popular online video format and is wildly used on YouTube, Hulu, VEVO and more. You may download many YouTube FLV videos and really would like to enjoy them on your new iPad Mini 2, but the iPad Mini 2 shows "invalid format" when you play them. What's to be done? Apple products only support MP4, H.264 video, so you should convert FLV to iPad Mini 2 friendly format first, and then transfer the converted video to iPad Mini 2 for playback. This article introduces an all-in-one solution to download and convert YouTube video for playback on iPad Mini 2. MacX Video Converter Pro delivers astounding YouTube downloading and converting performance, which lets you download video and MV from YouTube and convert it for offline playback on iPad iPhone Mac and Android devices without restriction. Click "YouTube" button on the main interface, the built-in YouTube Downloader window will pop up automatically. Then copy and paste the YouTube video URL to the address bar. Then click "Download Now", after a few minutes, the downloaded video will be automatically added to the convert list. Choose the output format as you like. To play YouTube FLV on iPad Mini 2, simply select iPad Mini 2 recognized format like H.264 or MPEG-4 as the output format. 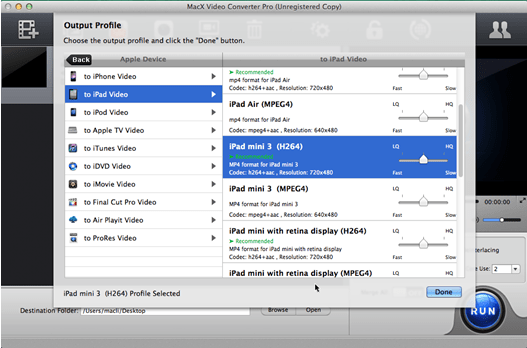 This FLV to iPad Mini 2 video converter also offers optimized profiles for the specific portable devices. So you can hit Apple Device -> to iPad -> iPad Mini -> Press "Done" to do the conversion. Hit the "RUN" button to start converting the downloaded YouTube video to iPad Mini 2 on Mac. After a short period of transition, you can sync the YouTube video to iPad Mini 2 for playback without limitation. Attributing to its built-in 320 video codecs and 280 profiles, MacX Video Converter Pro clears all obstacles and allows you to convert any video to a myriad of iOS and Android gadgets, e.g. convert MP4 to iPhone 5, M2TS to iPad, MKV to Android, etc, so that you can get your videos shuttled among diversified phones and tablets without worrying about format incompatibility. How to make copies of protected DVD on Mac OS? MacX DVD Ripper Pro allows you to rip protected DVD to video TS so that you can burn Video TS to DVD for a backup. Copy DVD to DVD for Mac in a few clicks. Anxious to play YouTube videos on Galaxy S4 when you are offline? This article shares some tricks to download and convert YouTube video to Galaxy S4 recognized format with a professional YouTube downloader for Galaxy S4. There are tons of iPhone video converters out there, but which is the best one to convert video to iPhone comparing with input output files, fast speed, features, ease of use etc. Read this reviews article about best iPhone video converter comparisons to get better advices.